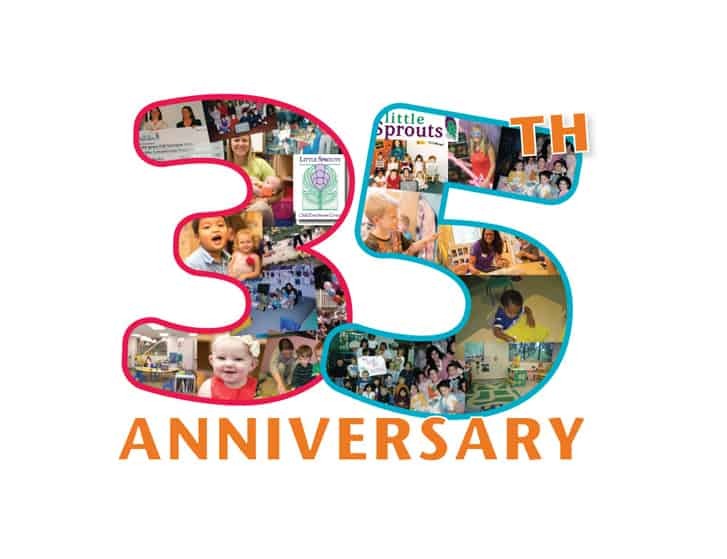 As we celebrate our 35th anniversary in 2017, we take a look back at the history of Little Sprouts and how we sprouted from a home daycare into an award-winning network of preschools in New England and beyond! In 1982, a seed of remarkable potential was planted and a truly unique vision was born. That seed was Little Sprouts, a modest, family-run daycare that realized the importance of an early start in play-based education. With an emphasis on a safe, nurturing, loving environment, the foundation was laid for what would become one of the most highly respected and reputable child care organizations in New England. During the early, formative years, the incredible ambition and passionate dedication displayed by the small team of teachers started Little Sprouts on a path of high standards that would remain its bedrock for years to come. Tuition was tracked on index cards stored in recipe boxes, food orders were completed by sometimes daily trips to the grocery store, and graduations were held in backyards. Everyone pitched in where they could to help realize the vision of granting children an extraordinary start in their education. Years passed, children flourished, and the Little Sprouts family continued to grow. In 1994, Little Sprouts expanded out of the home daycare space and into the school environment in the form of Little Sprouts Methuen. Two centers, located in Lowell, MA and on the Haverhill NECC campus, followed soon after in 1995. The mission-driven, steadfast focus remained: to create a nurturing and safe atmosphere that encourages growth, development, and fulfillment encompassing each child, family, and professional in the Little Sprouts community. Since then, Little Sprouts has continued to offer this loving care to children and families from all walks of life in an unwavering devotion to inspiring a lifelong love of learning. Educators attracted to the Little Sprouts philosophy flocked to the schools, and began their path of shaping the lives of hundreds of children. With successful programs fully underway and gaining momentum in the Merrimack Valley, Little Sprouts began to expand its impact within communities across Massachusetts. New schools began sprouting up in Andover (1997), Lawrence (2004), Haverhill and Woburn (2008), and Amesbury and North Andover (2009). Further, the Little Sprouts brand of quality care was extended to school age children, in the form of before- and after-school care in some of the larger schools. The word continued to spread among families in New England; a clear choice for quality care had arrived, and it was innovating the way in which families thought about early education. After opening a location in Dedham in 2009, Little Sprouts seized an opportunity to service the commuting families in the city of Boston with a school opening in Brighton, MA, as well as a chance to respond to the demand for more care in Andover with a second location in 2010. A modest space was transformed into a loving Little Sprouts schoolhouse in Wilmington in 2011, followed by exciting new potential in 2012: the first New Hampshire based Little Sprouts in Nashua, as well as additional city-based schools located in the South End of Boston and on the Boston University Medical Campus (BUMC). The definition of “family” began to take a new form. Little Sprouts alumni had now been proving the results of the Little Sprouts formula for years. Parents embraced their children’s educators as extensions of their own family, and the sentiment was returned by compassionate, loving teachers. The demand for such a valuable program began to reach new areas, including another New Hampshire school in Stratham in early 2015. Soon to follow was a beautiful, newly renovated space in Melrose opening in June of 2015. Right around the corner in July of 2015, three beloved schoolhouses in the communities of Arlington, Belmont and Concord converted to the Little Sprouts curriculum and philosophy. Along this winding, happy path of growth, Little Sprouts acquired numerous accolades and marked several milestones. Among the most prestigious is the Early Reading First grant, awarded to Little Sprouts several times over the years. Presented by the U.S. Department of Education, this grant bestowed millions of dollars to Little Sprouts, which allowed the organization to graduate over 1500 preschoolers with equivalent or higher academic benchmarks than their peers in their age group, regardless of socio-economic background. The grant also afforded the organization to engage field experts to develop its own proprietary infant and toddler curriculum, which uniquely combined age-appropriate, industry-wide best practices in early education to further strengthen the experience of the program’s youngest constituents. Although only nestled throughout charming New England, Little Sprouts has made its presence known on a national scale. On a local level, the Commonwealth of Massachusetts has recognized Little Sprouts as one of the most high-quality providers of early education in the state. One such example is the launch of the Lowell Collaborative Preschool Academy (LCPA) in 2015, a school with the admirable goal of providing a pre-K experience that is equivalent to or exceeds that of a public school. A project of the Massachusetts Department of Early Education and Care, only five sites in the state were selected as part of this national project that included only a modest number nationwide. Little Sprouts was the only for-profit institution to have been selected to partake in this extraordinary project; in consultation and collaboration with non-profit entities, Little Sprouts was engaged to share its extensive repertoire of innovative best practices and lend insight into the intersection of the public and private education sectors. The launch of the LCPA further established the company as a stand-out provider of superior early education and care amongst its peers. New Schools and The Future! As Little Sprouts celebrates its 35th anniversary in 2017, the drive to provide an exemplary educational experience for children is as strong as ever. This year, with the opening of the first school on the North Shore proper in Peabody, as well as another large, inviting school for commuting families located in Watertown, there are now 24 Little Sprouts filled with hugs, smiles and laughter every day. From 1982 to 2017, one theme has united the organization, the children, the families, and the staff across its 35 years: Little Sprouts is here to grow, to love, and to care.